Gearbox doesn't have time to make a Borderlands 2 Vita port, but still wants one. For those with a compulsion to pick up loot, there are few games out there more addictive than Borderlands, which combines item hunting, RPG mechanics, and some clever writing. Up until now, gamers have been able to escape the shooter's entangling tendrils by leaving the house, but if Gearbox CEO Randy Pitchford has his way, that kind of failsafe will not apply to the upcoming sequel. Pitchford wants to take advantage of the PS3-Vita connectivity with a portable version of Borderlands 2, but would need an outside company to develop it due to time constraints. "I want to be able to have the character I'm working on with my PS3, and then when I'm on the road with my Vita I can just keep developing that same character because it exists on the cloud somewhere," says Pitchford. While the staff at Gearbox is otherwise occupied (namely with making the console/PC versions of Borderlands 2), the CEO is willing to share his assets with another company if it means his dream of on-the-go Borderlands could come true. "We're too busy to develop it ourselves. But I know there are a lot of talented developers who could take our code, our source and our content and perhaps create something like that." Even if Borderlands 2 hits the Vita, there may be some logistical problems playing the game in the same fashion as its full-size brethren. Continuing a character's progression on the go means that each session would have to begin and end with an online sync, which may not be possible sometimes for those who lack a 3G plan on their Vitas. Even those with a plan would have to be cautious about running up against data limits, since character syncing and online play would likely eat through 3G coverage pretty fast. Nonetheless, it's probably better to secure the game first and worry about its theoretical drawbacks later. 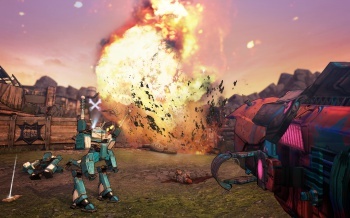 After all, if Borderlands 2 gets a fully functional, cross-platform portable entry, its biggest problem for many players may be finding an excuse to put it down.